As a non-profit organization, MTRA exists because of the time and generosity of others throughout the Marion county and surrounding communities. We continue to need your care and support. For questions about becoming a volunteer, please eMail our office. There are a wide range of opportunities for individuals, families, church groups, clubs, schools and businesses to take an active role in a way that is the most meaningful to them. As a 501(C)3, all donations are tax-deductible. 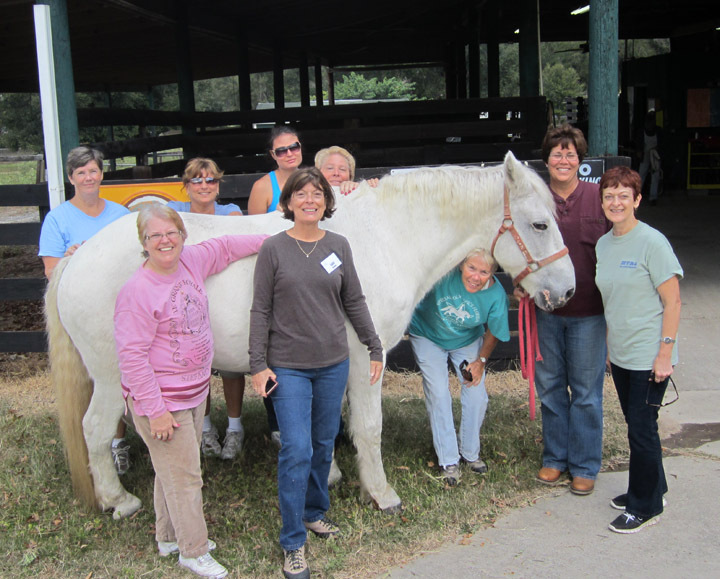 We hope you will explore some of the ways you can help MTRA continue its rich heritage of helping clients of all ages and disabilities achieve the extraordinary physical and psychological benefits of therapeutic horseback riding. Additionally, we are always open to ideas to generate sustainable ways we can deepen our program and continue to play an integral role in the lives of our clients. Click HERE to download our Volunteer Handbook. Join the MTRA Dream Team! Leaders: This is the person who leads the horse for our assisted riders. Horse experience is preferred, but not necessary. Side Walkers: The side walkers assist in putting the assisted riders on and off the horse, and then walk on either side of the rider throughout the lesson, sometimes physically assisting the rider to balance. We are especially in need of volunteers who are physically capable of assisting with our Hillcrest riders who are more severely disabled and require a bit of strength with assistance. Journalist/writers: One of the most important factors with keeping MTRA in the black is handled by publishing a newsletter, creating email news releases, soliciting publications for donated space or receptivity to including articles relating to MTRA events and news, helping with Volunteer, rider, sponsor and donor communications, etc. We are very much in need of help in this area. We also are very busy researching grant opportunities and writing grants and can always use assistance in this area. Photographers/videographers: We are always in need of good quality photographs and video of our events, lessons and riders. Video editing capability is a plus! Administration: Whether you are an obsessive-compulsive organizer or just someone who would like to help and takes good direction, we always have a need for help in our offices! Maintenance: Love to landscape or garden? Like to build things? Have some mechanical abilities and no place to use them? Tell us what you love to do and we’ll find a pairing for you! We have tractors, lawnmowers, mules that need maintaining and grass to mow, pastures to drag, flower beds to maintain and landscaping that needs TLC at both Greenway and Hillcrest locations. Jack-of-all-trades: Have a skill we haven’t mentioned, but think you might be able to spare an hour a week or so? Send us an email or give us a call at 352-732-7300 and let’s brainstorm! All Volunteers are required to complete a set of Volunteer Application Forms for both MTRA and the state of Florida Department of Environmental Protection/Florida Park Services. Any volunteer candidate that has the potential to interact with our clients will also be subject to a Level 2 Background Check. Click HERE to download the forms.